This is a great idea - way to go in finding another way to fit flying into a busy schedule! Next time give me a shout! I'll order us take out! Great article Paul! I would love for you to post similar articles on our site www.skychattr.com a site for aviation professionals and travelers worldwide. Please join us soon! I'm trying to generate interest in a cool t-shirt club (http://aviationtshirtclub.com). 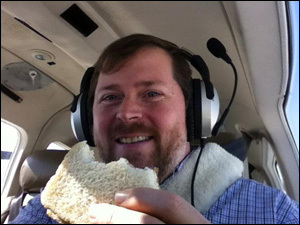 I hope to highlight those great $100 hamburger places that make us want to fly! If interested, I'd love to let you know when it takes off!